These 14 members of our team were selected to race Novum from Nebraska to Oregon, along the Oregon Trail and through the Rocky Mountains. The Race Crew is composed of mechanical, electrical, and aerodynamic engineers, as well as sponsorship, marketing, and operations members. The 2018 race crew finished 2nd in the American Solar Challenge and Novum was the first American car to cross the finish line. 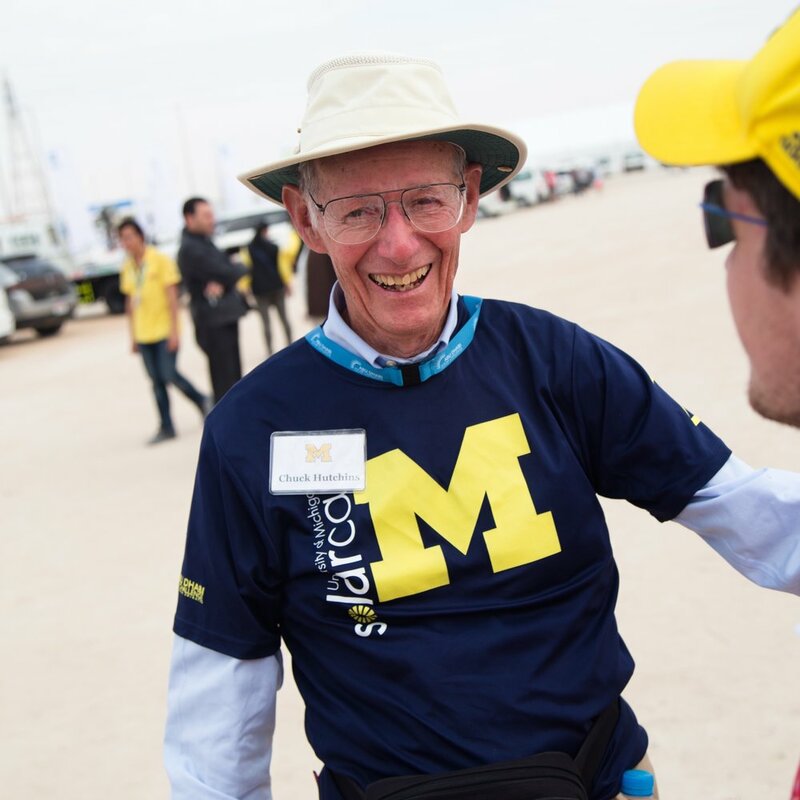 The University of Michigan is built atop the leaders and best — and throughout its history, the Solar Car Team has always been among the greatest. Noah came to Michigan seeking to be a part of this incredible institution and joined the Solar Car Team in the fall of 2016 hoping to contribute to these legacies. Originally a member of the Strategy Division, he is a rising senior studying computer science in the College of Literature, Science, and the Arts. His goals for our team this summer are to prepare for and compete in the upcoming American Solar Challenge and ensure that the team is in a position to succeed in the next World Solar Challenge. UM Solar Car is not why Lynne came to the University of Michigan--but it is the reason she applied. After seeing the team in a documentary, Lynne felt drawn to the idea of working in a team to build something exciting and novel. So, when the time came, Lynne made sure to send off an application to Michigan. She joined the team's business division her freshman year, (when she named Novum! ), before becoming Business Director this year. As Business Director, Lynne is responsible for managing sponsor relationships, overseeing the team's finances, and marketing. Her favorite thing about UM Solar Car is the spirited community and the people who make it so strong--from passionate sponsors and old friends of the team to dedicated teammates and alumni who continue to contribute in big ways and small. Another favorite thing: tinkering with old solar car steering wheels! 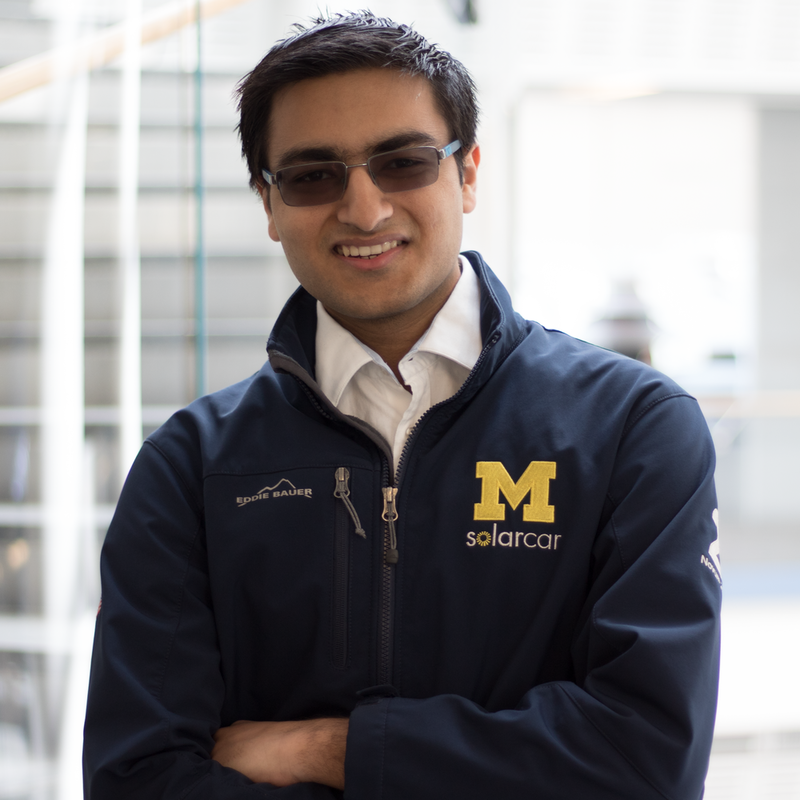 Before coming to the University of Michigan, Vignesh was inspired to join the Solar Car Team through seeing the team featured in a Superbowl advertisement. Upon coming to campus as a freshman, he learned more about the legacy and history of greatness preceding the Solar Car Team, and joined in order to become a part of that legacy. Though he is majoring in a very theoretical field, Vignesh likes working with his hands and visualizing tangible progress, and Solar Car provides that opportunity. As Operations Director, Vignesh manages Novum’s manufacturing plan, organizes race logistics, and procures the resources necessary to win the 2018 American Solar Challenge. When he’s not working on Novum, Vignesh enjoys tackling tough math problems, beating his friends in board games, and brewing his own coffee. Chae Woo Lim is a rising junior in the College of Engineering, majoring in mechanical engineering and minoring in space sciences and engineering. He chose to be a Wolverine because of the support and passion that the school has towards student project teams. Chae Woo was originally on the team as an aerodynamicist and raced in the 2017 Bridgestone World Solar Challenge as a driver and a mechanical. This year, Chae Woo has taken on the roles of Engineering Director and Crew Chief for the 2018 American Solar Challenge and hopes to continue the success and legacy of the team. He is still a firm believer that there is a positive correlation between aerodynamics and attractiveness, and will challenge anyone who says otherwise. Brendan is a rising junior in electrical engineering from the Chicago area. He joined the team in 2016 in the Microsystems Division having been fascinated by the automotive industry and green energy since childhood. After two years of helping to design Novum, he is happy do more hands-on work this summer. Additionally, he enjoys long distance running and classical guitar. He is excited to compete this summer in the 2018 American Solar Challenge. Ian is a rising sophomore studying computer science. He decided to join the Solar Car Team long before coming to Michigan. After two semesters working on the project, he knows he made a good choice. The team's rigorous design cycle and ambitious goals inspire members to apply and learn a wide variety of skills. Ian has learned that these skills are not exclusively technical: racing the car will require every bit of the team's determination and courage. During ASC 2018, Ian will watch the weather and inform the crew of any dangers or potential strategies. Ian looks forward to helping design and build the team's next car, which will race in BWSC 2019. Noah Evile is a rising sophomore studying mechanical engineering at the University of Michigan. He grew up on the island of Oahu, Hawaii, and spent much of his high school career participating in robotics and other STEM-related organizations. Noah joined Michigan Solar Car in the fall of 2017 as a freshman in the Suspension Division with a heavy interest in the design process to develop mechanical components. Noah joined race crew for a chance to work with Novum as a whole, and is excited to learn the process of manufacturing a solar car. Sam is a rising sophomore in computer engineering at the University of Michigan. He joined the team’s Strategy Division in the first semester of his freshman year. He was drawn to the team due to its legacy and his want to expand his engineering knowledge beyond the scope of his classes. Over the past year, he has enjoyed working with other students to prepare Novum and the team for the American Solar Challenge. Sam is excited to be a part of 2018’s Race Crew and race Novum this summer. Matt joined Michigan Solar Car in the fall of 2017 as a freshman in the Aerodynamics Division, given his strong interest in the novel ideas the team has used to gain a competitive edge. Matt sees Michigan Solar Car as a supplement to his coursework and an opportunity to apply academic concepts in a real-world setting. After a full semester with the team, Matt joined race crew to experience the high expectations of a race environment and test his contributions against a collection of the best schools in the country. He is proud to dedicate his summer to 2018’s race crew and to attempt to build on the team’s well-documented success. Rishabh is a rising sophomore studying electrical engineering at the University of Michigan. He always had a passion for electronics and looked to further his skills by joining the Solar Car Team. After a year of being on the team, he gained hands-on experience in designing, building, and testing the electrical systems of the car, and joined race crew to experience the high-pressured competitive environment and test his skills. He is excited to spend the summer with 2018’s race crew working on Novum and racing in the American Solar Challenge. Daniel Kohler is a rising junior studying computer engineering. He joined the team in the Winter of 2018. Daniel has proposed new battery designs which may potentially be implemented in next year’s vehicle. He is hard-working and determined to win. Daniel also helps out with the mechanical branch of the team when needed. Daniel’s favorite hobby is skateboarding. As a freshman, Rishav Mehta has always had an avid interest in cars. Having attended the Detroit Auto Show nearly every year since he was five years old, he has always known who and what Solar Car was about. After receiving attendance into University of Michigan with a strong interest in computer science, joining the Solar Car Team seemed like the perfect idea. Over the past year, what with learning so much about what happens behind the scenes--from the carbon fiber molds to using ML Models to predict weather--Solar Car has become one of the few things he proudly considers fun rather than work. Andrew Olejniczak is a rising junior majoring in computer science from Macomb, Michigan. He joined the team as a strategist in the first semester of his sophomore year. Andrew enjoys programming, challenges, and working with his hands. In his free time, he loves visiting the National Parks, hiking, and playing basketball. Andrew is excited to race for the first time in the American Solar Challenge this summer. Filip Platek is a rising sophomore studying aerospace engineering at the University of Michigan. He grew up in the Bay Area, California, where he got his start in design teams though high school rocketry competitions. Craving a similar experience in college, he joined the University of Michigan Solar Car Team’s Aerodynamics Division in his first semester. Filip looks forward to racing in July as a mechanical engineer for the 2018 American Solar Challenge Race Crew. Neil Dasgupta is an Assistant Professor in the Department of Mechanical Engineering at the University of Michigan, and faculty advisor of the UM Solar Car Team. He earned his Ph.D. from Stanford University in 2011. Prior to joining University of Michigan in 2014, he was a postdoctoral fellow at the University of California, Berkeley. He is the recipient of an AFOSR Young Investigator Award (YIP), a 3M Non-Tenured Faculty Award, the AVS Paul Holloway Young Investigator Award, the SME Outstanding Young Manufacturing Engineer Award, and the ASME Pi Tau Sigma Gold Medal. His research focuses on the intersection of nanotechnology, manufacturing, and energy conversion. Umesh Patel is Senior Director, Business Engagement, at the University of Michigan and works closely with companies to engage them in the University's research, education, and service missions. Mr. Patel came to the University from consulting firm Accenture, where he was a Senior Manager managing business process and technology change for a diverse group of global 500 corporations and government clients. Prior to joining Accenture, Mr. Patel was a Design Engineer with Westinghouse Electric Corporation where he designed and developed electrical control equipment. Mr. Patel holds an MBA from Carnegie-Mellon University and a BS in Electrical Engineering from The Ohio State University (note: despite his Buckeye roots, Mr. Patel is married to a U-M alumna and the proud parent of twin daughters both attending U-M). Chuck Hutchins graduated from the University of Michigan with a BSE in Mechanical Engineering in 1957, along with his wife, Ann, who he met and married in 1956. He spent 8.5 years at Buhr Machine Tool Co in AA where, in 1962, under his leadership, they acquired one of the very first N/C machine tools with a transistorized control. Buhr had four N/C machines running 24/7 when he left in 1966. In 1969 he became the co-founder of Manufacturing Data Systems Inc (MDSI) on Plymouth Road and is a pioneer of computer-integrated manufacturing. In 1989, Chuck was approached by team leader Susan Fancy to see if he would be a sponsor. He quickly saw one of the most "Real World" student projects he had ever seen. Chuck became the #1 fan of the University of Michigan Solar Car Team and he and Ann have been supporters ever since. He has traveled with the team on every race except '90 and '93 in Australia, and will be travelling to Nebraska to join the team on race. Chito Garcia is a retired scientific instrument maker from the University of Michigan College of Engineering. His first involvement was in 1991 when he machined parts for the 1993 team's solar vehicle. In 1993, Chito was asked by the team to join them in racing the new car, "Maize and Blue" in the World Solar Challenge in Australia. Since then, he has been involved with the team every year and has been to every Bridgestone World Solar Challenge and American Solar Challenge UM Solar Car has competed in. He is a valued member of the team and has been passing down the team's history and knowledge year after year.